Baby corn 65 is a quick appetizing recipe that is loved by kids and grown ups off all ages . I have tasted these baby corn in the restaurants and I loved them . so now off to today's post baby corn 65 recipe . 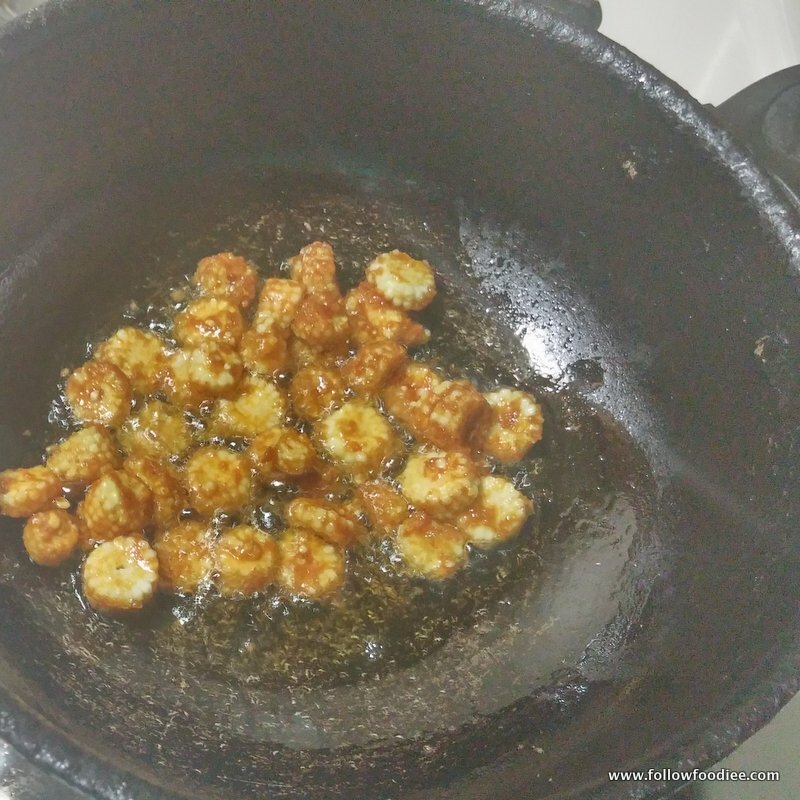 In a mixing bowl, add the sliced baby corn, corn flour, channa dal flour, red chili powder, and salt . Sprinkle little water and mix them well .Set aside for 1/2 an hour. In a shallow frying pan, heat oil. Drop the marinated baby corn and deep fry till it turns brown in colour. Serve hot with sauce. Baby corn 65 is ready ! If you like this recipe please like my Facebook page here to get regular recipe updates , or follow me on twitter here , pinterest here , and Google plus here to get regular updates of recipes . Take the pressure cooker , Add the washed rice , water and Milk . Cover with lid and pressure cook them for 4 hisses . Once the pressure releases , Open the lid of the pressure cooker and Mash them up with a spatula . Take the broken jaggery in a kadai . Add some water just to immerse them . Melt them . Now add the mashed rice to the jaggery and Mix . Melt some Ghee in a different pan . Add the raisins and allow them to pop . Transfer them to the Sakkarai Pongal . 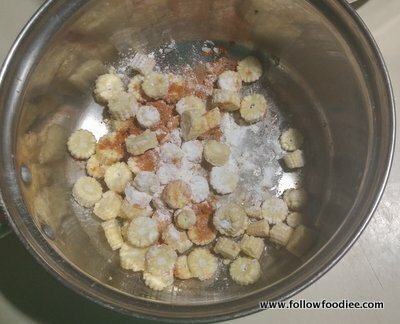 Mix them well and the Sakkarai pongal will start leaving the edges of the pan . Delicious Sakkarai Pongal is ready to be served . Ghee can be replaced by Oil . Fried cashew can be added to the Pongal when serving . Check out the other Indian Sweet , dessert recipes Posted in the blog below . Click here to view all the other Dessert recipes in the blog . Vegetable Kola Urundai or Vegan Meat balls is made using the Green Banana and some flavorful spiced ingredients . This recipe is made in a similar way to the Mutton Kola Urundai that i have posted here . So now off to today's post Vegetable Kola Urundai Recipe or Vegan Meat Balls . Take the Raw Green Banana in a pressure cooker . Fill the cooker with some water . Cover with the lid and pressure cook the contents for 3 -4 hisses . Cool them . Remove the skin of the cooked banana . Mash them well . Take the mashed Banana in a Bowl . Add the Ginger garlic paste ,garam masala powder , Green chilli , salt , Mint powder and Mix them well . Add the roasted channa dal powder and bind them well . Make tiny balls of the dough . Heat oil . Drop them in oil and fry till they become golden brown in color . Done ! Kola Urundai (Vegan Meat Balls ) is ready to serve . My kids absoultely loved these Kola Urundai ( Vegan Balls ) . Click below to check out some Raw Green Banana Recipes . Check out all the other Vegan Starters posted in the blog by clicking here . Thakkali Kulambu ( Kuzhambu ) is a simple and a quick curry that goes well with steamed Rice , Rotis or Idli dosa Recipes . This recipe calls for few ingredients . Thakkali Kulambu can be made in a jiffy . So off to todays Post Easy Tomato Curry Recipe . Take a heavy bottom pan and fill with water , add the tomatoes . Bring them to a boil. Allow the tomato to cool down a bit . chop them roughly . Take the chopped pieces in a blender and puree them . Take the chopped coconut slices , cumin seeds and some water in a blender . Puree them and set aside . Heat a heavy bottom vessel or a kadai . Add oil . Now add the mustard seeds and urad dhal and allow them to spultter . Now add the chopped Onion . Fry till they become translucent . Add the curry Powder or Curry Powder , salt , Turmeric powder and mix . Now add the pureed tomato and bring them to a boil . Cook till the raw smell goes away . Now add the ground coconut paste and bring them to a boil . Cook till the oil separates out from the curry . Delicious Thakkali Kulambu is ready to serve . Enjoy this delicious Tomato curry with Some Steamed Rice , Idly , Dosa , Parathas . Red Chilli Powder and Coriander powder in a ratio 1:1 that is one tea spoon of red chilli powder and one tea spoon of coriander powder could be substituted for Curry Powder . Click here to find all the list of Curries in the blog . I had some Left over Black eyed Peas or Karamani after making this Black eyed peas curry or Karamani kulambu . Hence I made these Vadas or Fritters are made with the Black eyed Peas . They tasted somewhat similar to the Lentil Vada or Paruppu Vadai recipe . My kids loved these Vada and they are healthy too . So now Off to today's Post Karamani Vadai Or Black Eyed Peas Vada Recipe or Lobia Fritters . Take the Black Eyed Peas in a bowl . Wash them well and Soak them in water overnight . Drain the water and take the soaked Black eyed peas in the blender . Add the Ginger , garlic , salt . and grind them to a coarse paste by sprinkling little water . Grind them to a coarse paste by sprinkling little water . Take the ground Paste to a bowl and add the roasted Channa dal powder and mix . Add some chopped onion and Mix them well . Heat oil for Frying . Make small lemon size balls of the vada and pat them between your palm and slide them in oil . Fry them till they turn golden brown in color . Karamani Vada or Lobia Fritters are ready to be served . Enjoy this Vada with some Juice or a Chai ( Tea ) in the evening . 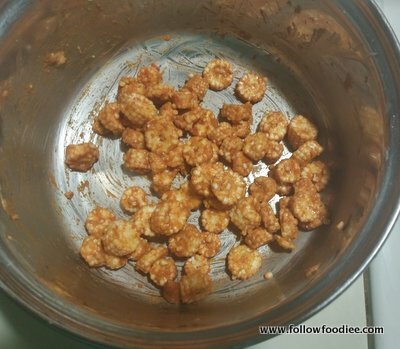 check out the Non Vegetarian Snacks recipes by Clicking here . Check out all the other Snacks Recipes in this website by Clicking here . Welcome 2015 . Happy New year dear Readers of this blog . Coming to today's recipe Pepper chicken gravy also called Milagu Kozhi Kulambu is a great recipe for treating common cold . This recipe calls for very few ingredients and can be made in a jiffy . This recipe pairs well with steamed rice and rotis . So now off to today' s post Pepper chicken gravy or Mlagu Kozhi Kulmbu . Heat oil in a Pressure cooker and add the chopped Onions and Broken chilli and cook till the onion become translucent . Add the cleaned Chicken, cumin and pepper powder , Turmeric powder , salt . Mix them well . Add some water around 1 1/2 cup of water and bring the contents to a boil . Cover with the lid and Pressure cook the contents to 2 hisses . once the pressure in the cooker relieves . Remove the lid . The chicken is cooked and Oil separates on the top. Pepper Chicken Gravy or Milagu Kozhi is ready . Enjoy the Pepper Chicken with Naan , flat breads and steamed rice . If you find the gravy to be too watery , bring the contents to a boil and let the water reduce its volume . The Pepper powder can be adjusted to suit the spice level . Check out the other Chicken Recipes in my blog below . Please Click the title of the post to view the recipe . Please Click here to View all the Chicken Recipes in my blog . If you like this recipe please like my Facebook page here to get regular recipe updates , or followme on twitter here , pinterest here , and Google plus here to get regular updates of recipes . @Follow Foodiee. Powered by Blogger.